1. QUERY THE EXPERTS. I recently read Crazy Mike's iPhone App Marketing eBook. For someone who is new to app marketing, I found the book and the case studies insightful and genuine. They share real information on how top apps like Pocket God and Paper Toss cultivated a following. The book also covers topics like effective iTunes store descriptions, email marketing, PR, social media, etc. Required reading for anyone who wants to have a shot at getting noticed on the App Store. In addition, I've started following an industry blog from AppsMarketing.Mobi. They feature interviews with developers, and write columns on industry trends. By digging in with experts, you can acquire marketing knowlege in advance of launching your app, which ultimately may result in a more successful app. 2. KNOW THY APP STORE. Whether you are launching on the iTunes App Store, on Blackberry's App World, or some other Google Android platform, learn how customers search for apps, and how the apps get listed on the store. Try and find out what drives the "What's Hot List" or "Staff Picks". Understand how you can be seen amidst 100,000 other apps. What are your categories and how have you listed yourself? You can make changes along the way, so don't hesitate to run experiments to find out what works. 3. INCLUDE SOME EDUCATIONAL APPEAL. From the perspective of family-friendly apps, if I'm downloading anything for my kids, I want it to be good for them. Highlight the educational value of your app. There is a growing market for kids apps - it's very hot - but it needs to be good for you too. 4. MAKE IT LOOK PRETTY. Have great graphics. There is too much competition to have crappy graphics. Making it look polished and professional is a minimum requirement. 5. LAUNCH IN ADVANCE. You don't need the app to be complete before you start your marketing efforts. Build buzz with social media in advance of your launch. Apps like @Arithmeroo and @Tales2Go are doing an excellent job of this. 6. REVIEWERS ARE YOUR FRIENDS. Read the app review blogs. When it's time to go live, these folks have the audience you need. Without them you are pretty much dead. Keep track of their posts, submit comments, find them on Twitter, and when it is finally your turn to submit your app, follow their instructions carefully. They are busy people. 7. NETWORK WITH OTHER DEVELOPERS. The most significant benefit of this past quarter has been connecting with other parent iPhone developers. From them, I've recognized benchmarks for successful apps and marketing practices. 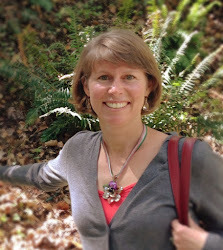 Kudos to our forum at Moms With Apps. 8. GET PROFESSIONAL WITH YOUR WEB AND SOCIAL MEDIA PRESENCE. Apps are their own little marketing engines. An appealing springboard icon that can double on your Facebook and Twitter profiles provides an integrated digital portfolio (@MomMaps is a great example). Having this all organized on a homepage with links to your blog, YouTube demos, and customer testimonials is a nice touch. 9. DON'T UNDERESTIMATE THE POWER OF YOUTUBE. Video is powerful. Video reviewers are probably more powerful. Getting a handle on this universal channel should be tops in terms of my 2010 priorities. More ideas? Fire them up! Let's make some great apps in 2010! Hi! I am an elementary special education (autism) teacher who is launching a 1:1 iPod Touch project in my class. My Little Suitcase is on our students' iPod Touches. 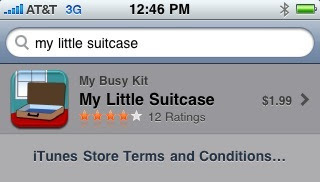 We are very excited to hear about the upcoming release of version 1.2 of your My Little Suitcase app. How can we participate in the review of the new version?? Hi Jeremy, thanks for your comment. That is fantastic to hear you are running the app on a project for your class. I can arrange promo codes for you once the app is live. Feel free to contact me (Lorraine) directly via support@mybusykit.com. I will also put up a blog post once we are live.